Billing itself as the “only tiger safari in the Philippines,” Zoobic Safari can be found inside the Subic Bay Freeport Zone. People visiting Zoobic Safari almost always also visit Ocean Adventure where you can find dolphins. But, going back to Zoobic (what a clever name), tigers are not the only thing you can see there; the zoo has ostriches and other birds, snakes, crocodiles, lizards, boars, and rodents! Visit the informative official website to learn a real lot more. Zoobic Safari is part of the Jungle/Forest Adventure zone of Subic Bay Freeport. The zoo occupies 25 hectares and most of it is occupied by the Savannah and Tiger Safari attractions. If you look at the zoo map, you can easily compare it with the satellite image from Google Maps. If you look closely (or if you’re imaginative enough), you might even see some animals as tiny specs in the satellite image. Photo of a Zoobic tiger by dannyboy. Quite unique to Zoobic is the “safari jeep,” a customized all-enclosed jeepney where you can see the tigers roaming wild in their jungle environment. If you’re adventurous, you can bring a live chicken to feed to them, as you can see in the picture above. 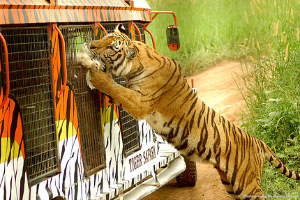 Ferocious as they are, you could actually pet some of the tamer tigers at the petting area. For an eyewitness account of Zoobic Safari, head on over to this post at our sister blog, Pinoy Travel Blog. If you’re looking for a really good zoo closer to Manila, Avilon Zoo is your best bet.